Hey, I’m so glad you stopped by today! My house is full of boys – hungry boys. I feel like I never leave the kitchen some days; someone always needs something to eat. 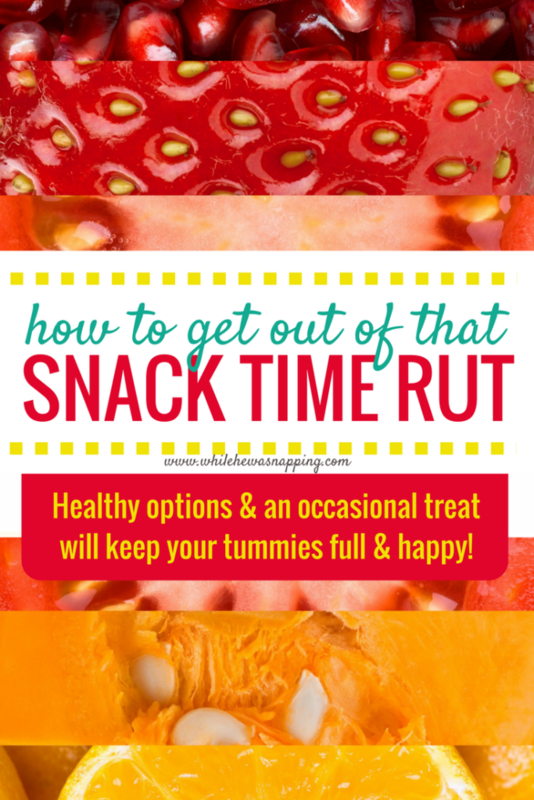 But, we get in a snacking rut and find ourselves eating the same things over and over. I know there’s a lot more options out there, but they just don’t come to me when I have little hungry piranhas, uhm, I mean boys, nibbling at my ankles. Have you ever fallen into a snack rut too? 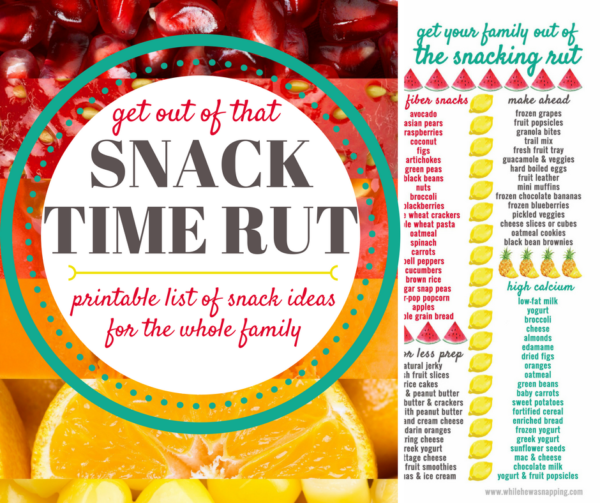 That’s where this printable list of snack time ideas comes in. 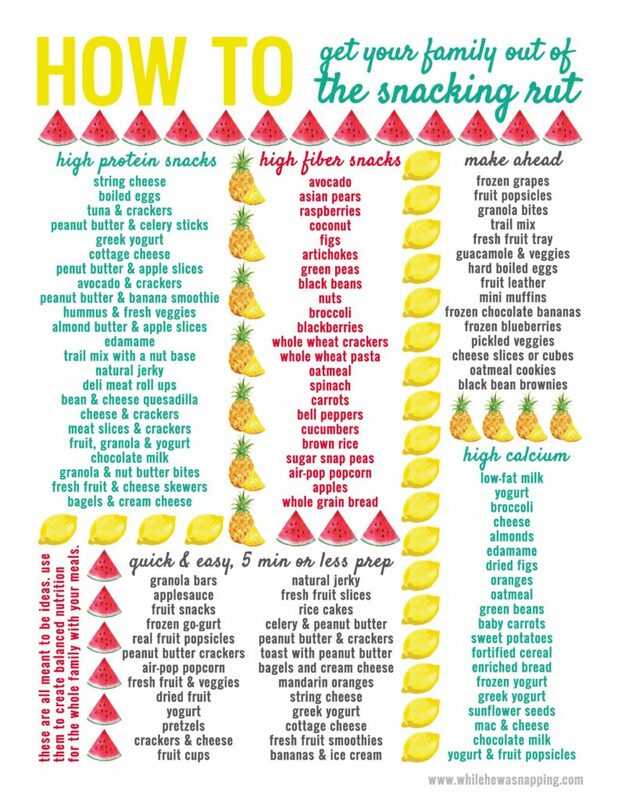 Next time you’re scrambling at snack time, just check out the list and choose something new. It can also help you make out your grocery list and keep your snacks from coming from the candy and chip aisles. Make snack time exciting with these yummy ideas! It wasn’t just my children I had in mind when I made up this list. It was my snacking habits as well. I’m totally guilty of grabbing a handful of chocolate chips out of the fridge when the munchies hit. But, not anymore! Your whole family can eat healthier, more filling snacks and you’ll all be better, short and long-term. You’ll snack less, which means less time in the kitchen for you. You’ll stay fuller longer and you’ll have more energy. Who doesn’t want that? Not all of these snacks are “healthy snacks”. Some of them are treats, particularly some of the quick-prep snacks. In our family, we believe moderation is the key to healthy and happy tummies. It is up to you to make sure your family has balanced nutrition and moderation. These are ONLY ideas! 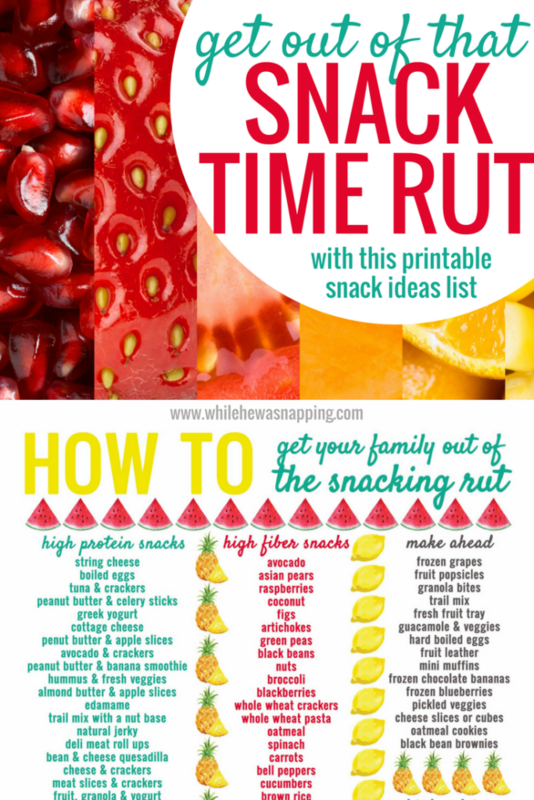 This snack time ideas printable will help you keep your family’s tummies full and happy so you can focus on the important things of summer: playing! It’s super simple. All you have to do is enter your info in the box below to unlock the premium printable and get immediate access. Step #1: Just click on the image below. A PDF file will open in a new window and you can save or print it. No email addresses, no waiting, just click below and you’re good to go. Because you’ve got better things to do – like guard the pantry and the refrigerator. Step #2: Leaving your snack list on the printer isn’t going to be terribly helpful, so hang that baby up where you can see it. Where the kids can see it. Where everyone who ever mutters “I’m huuunggreeeyyy” at you can see it. If your house is anything like mine, it can be questionable whether a piece of paper is truly going to survive more than a few days. If you want to prolong the demise of your snack ideas, you can laminate the page or simply slide it inside a page protector. That’s it. You’re ready for a summer of fun, healthy snacks! Go you! Make snack time a breeze with this list of ideas. Some are simple and some a little more complex, but all are suggested with kids and busy schedules in mind. There’s healthy suggestions to keep your family strong and ready to play, along with sweet treats for the occasional sweet tooth. With a little planning, your family will eat healthier, eat less, stay fuller longer and have more energy for all the summer fun headed your way! 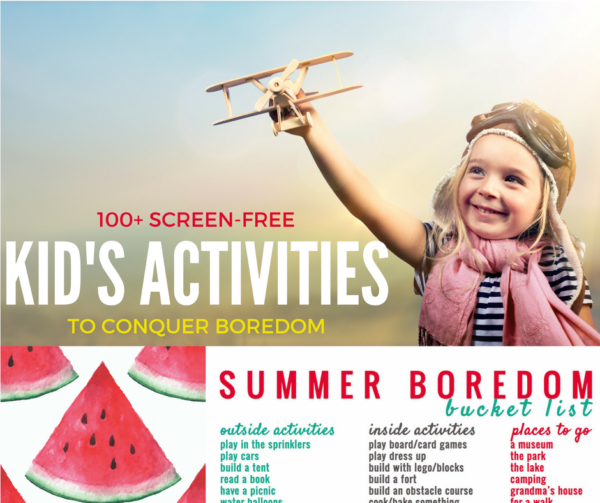 If you need some ideas of things for the kids to do this summer, check out this awesome Boredom Bucket List with over 100 ideas. Ideas are divided into outdoor activities, indoor activities and activities that will get everyone out of the house.